Just how far into uncharted territory Trump will go to deliver a historic deal is what has experts worried. 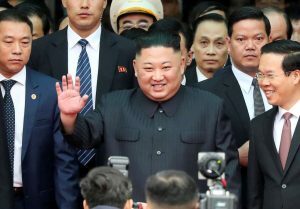 Kim could promise to destroy North Korea’s Yongbyon nuclear complex and a few other nuclear testing sites and extend its pause of nuclear and missile tests. Trump Administration officials have repeatedly said that removing nuclear weapons from the Korean peninsula is the ultimate goal, but Trump himself showed over the weekend that he’s content, for now, with Kim’s freeze of nuclear weapons and ballistic missile testing. But it’s what Trump may offer in return that is raising concern. Trump and Kim may sign a political statement declaring an end to the 70-year-old Korean War, acknowledging on paper the reality that most active fighting has ceased since the Korean Armistice Agreement was signed in 1953. Such a declaration has been discussed in talks with North Korea for decades, but the U.S. position previously has been that it would acknowledge and end to the Korean War only after North Korea has completely given up its nuclear weapons program. Such a declaration wouldn’t be a formal peace treaty or replace the armistice, which would require assent from all the signatories of the ceasefire, including China and the United Nations Command. But South Korea’s president Moon Jae-in has argued that a joint statement would start the process of officially ending the Korean War. “It’s a meaningless, feel-good gesture that carries risks with it,” Bruce Klingner, a research fellow at The Heritage Foundation, a conservative think-tank in Washington, and a former senior CIA official specializing in Korea. “If it’s given in return for freezing Yongbyon. That’s a new price we’ve paid for something we’ve gotten several times before,” Klingner said, referring to North Korea’s promise to dismantle the Yongbyon Nuclear Scientific Research Center in earlier peace negotiations. Klingner believes the U.S. should not sign a peace declaration while North Korea still has a nuclear program. In addition, Klingner argues, declaring the war over would open the U.S. up to pressure to remove its 28,000 troops stationed on the Korean peninsula, a long-term goal of the North Korean leadership, and one that Trump himself has long agreed with, though it would be a break with decades of bipartisan agreement in Washington. Researchers at the Center for Strategic and International Studies found scores of statements Trump has made over the years expressing skepticism of the value of keeping American troops in South Korea. “This could be a watershed moment in the U.S. position in Asia,” said Cha. “Trump will open the door to recognizing North Korea as a de facto nuclear weapons state and could raise questions about why the U.S. still has troops on the peninsula,” Cha said. Jim Walsh, a security expert at Massachusetts Institute of Technology’s Security Studies Program, said that Trump must pay attention to the details of any deal and understand the broader regional implications beyond signing something in order to notch a public relations win.